Learn how to bid nil and blind nil to improve your chances of beating your friends and family at spades. By bidding nil or blind nil, you try to play out the hand without winning any tricks, and you can reap big points if you're successful. Deal 13 cards to each of the four players. Check to see the quality of your hand. In spades, high cards of each suit tend to win tricks, and spades trump all suits. It's possible to go nil holding the ace or king of a non-spade suit if you have several other cards of that suit. That way, you can play your low cards and throw off your high cards when other players lead with the other suits. For example, you are dealt the 2, 4, 7, 8 and the ace of hearts. When hearts are being played, you can throw your low hearts to guarantee you won't win the trick. Then when diamonds, clubs or spades are being played, you can toss your ace of hearts (after you have played all of the cards you have of the leading suit) without fear of winning a trick and spoiling your nil bid. In many variations of spades, the low club is played first. Therefore, in these games it's always risky to bid nil if you lowest club is 5 or higher. You usually won't get caught with the 5 of clubs unless each of the other players has the 2, 3 and 4 of clubs, respectively. So if you are behind in the game, it may be worth the risk. Never bid nil if your lowest club is the 6 or higher if you are playing this variation. Check your spades. Don't bid nil if you have more than three spades, as it is easy to get caught with an extra spade at the end of the game. Also, don't bid nil if you have a spade higher than 9, as the paint cards can get you into trouble if your partner doesn't have high spades. If your hand is sufficient for the challenge, bid nil. In most variations, a nil bid is worth 100 points: You gain 100 points if you're successful but lose 100 points if you catch a trick. Play out the hand. Throw out the highest card of each suit that you can without winning each trick. For example, if someone plays a queen of diamonds, you can now safely toss your jack of diamonds. Blind nil is much riskier than nil, because, as the name suggests, you must do it without looking at your cards. In some variations of spades, you can only make this play when you are a certain number of points behind your opponents; and, in truth, this is the only time you would want to try it, because it is a very dangerous play. If you're successful you get 200 points, and if you're unsuccessful you lose 200 points. After you bid, you may look at your cards. 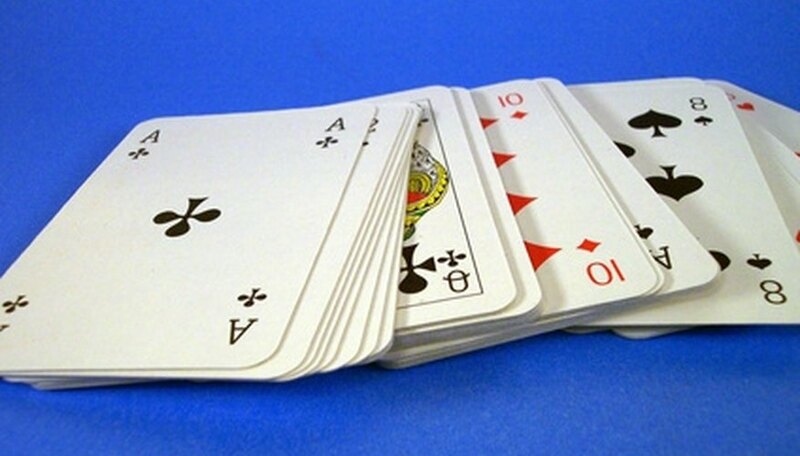 In many spades variations, you may trade one card with your partner. In some games, players trade two cards, but this can make a successful blind nil too easy, and is not recommended for your game. If you are allowed to trade a card, give your partner your highest spade, unless you have only low spades and they number less than four. Then, give him an ace or king of any suit of which you have a small quantity and could get stuck catching a trick. If playing where the low club leads, your partner will tend to give you his lowest club. Play out the hand as before, trying to avoid catching any tricks.